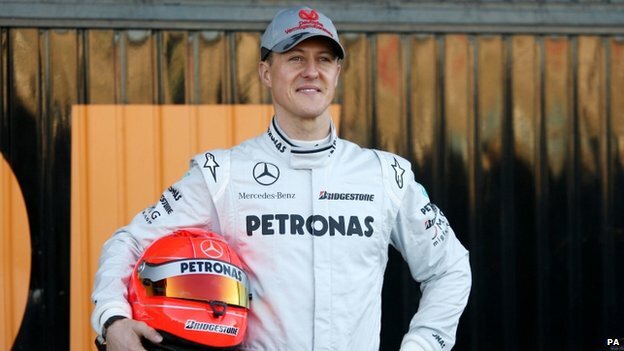 f1 champion michael schumacher has left hospital in grenoble and is no longer in a coma, his family says. The 45-year-old german will continue his rehabilitation at an undisclosed location, they said in a statement. Schumacher was placed in a medically induced coma after suffering a severe head injury in a skiing accident in the french alps on 29 december. His family thanked people who had sent messages of support, saying: "we are sure it helped him." They also praised the "excellent job" of medical staff at the hospital in grenoble, in south-east france. Doctors had kept the seven-time champion in a coma to help reduce swelling in his brain. "michael has left the chu grenoble to continue his long phase of rehabilitation. He is not in a coma anymore," schumacher's manager, sabine kehm, said in a statement on behalf of his family on monday. "for the future we ask for understanding that his further rehabilitation will take place away from the public eye," she said, without specifying where schumacher had been taken to. Relatives have previously warned that "it was clear from the start that this will be a long and hard fight for michael". Investigators probing the accident said schumacher had been going at the speed of "a very good skier" at the time of his crash in the resort of meribel. He had been skiing off-piste when he fell and hit a rock, investigators said. Schumacher retired from racing in 2012 after a 19-year career. He won two titles with benetton, in 1994 and 1995, before switching to ferrari in 1996 and going on to win five straight titles from 2000. He might not be the "same", but at least he's still around! Wow! I'm stunned. I honestly thought he wouldn't make it after being in a coma for so long. I know he'll never be the same but at least he's still with us. Great news by the cynical side to me makes me think it's still a whole before he'll be back to his best. He's a fighter for sure. *claps* Fantastic news. He has a lot of catching up to do I'm sure. My only thought is that with such an injury and lengthened coma it can bring a lot of life changing conditions including amnesia and behavioural changes. I remember when my father had brain swelling and he had to have keyhole surgery (some 15 years ago now). Ever since then he has been a lot more sarcastic, less active, and more mouthy - but only towards the family and not anyone else. So it can certainly change someone, some things will be better and some things will be worse, but at least he will be alive which is the main thing. He can finally get to watch the F1 that he loves and see Hamilton take the title from Rosberg. Great news, really hope he makes a full recovery!